Getting outside is great for your overall well-being, but if you have a few bad habits, it could be doing more harm than good. Small tweaks to your form, protecting your body to live a healthy, long-lasting life and preventive maintenance can all help make your outdoor experiences more fulfilling. Here are some habits to break to avoid feeling any negative repercussions from your outdoor adventures so you only reap the benefits of getting outside. Knowing your environment for your outdoor activities is key for preparation. For instance, a day on the beach is an occasion for flip flops, but they are not appropriate for a day down by the river. River stones are slippery and improper footwear is an easy way to get to hurt by slipping and falling or getting your sandal stuck between rocks. 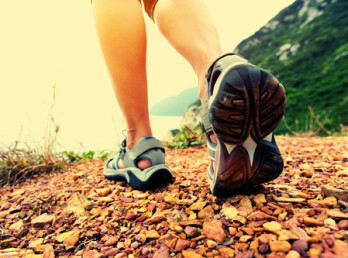 Wearing tennis shoes with little bottom tread to go on a hike is another common mistake. Investing in a good all-around adventure shoe, such as an approach shoe or adventure sandal, is a great investment. A pair of sandals that strap to your foot and have proper arch support will be much more comfortable and safer for most days spent in the sun. We are all eager to get outside, but taking a few minutes to warm up your body can help avoid injury and mentally prepare you for the day’s activities. Stretching is best for your body after a five to 10 minute warm-up of brisk walking. In addition to your legs, make sure to stretch your arms and sides. It can help in preventing debilitating side cramps that can ruin your day’s activities. Most are conscious of the fact that our skin hasn’t seen much sun over the winter months and pull out the old suncreen tubes from last summer. For most outdoor enthusiasts, it is easy to remember to slather on sunscreen at the onset of spring, but it gets thrown to the wayside after we get that good “base layer” going. It is necessary for your skin’s health to protect it from the sun throughout the year. Using a face lotion with an SPF in it everyday is highly recommended. Try keeping a small tube in your backpack, glove compartment and first aid kit so that you don’t ever find yourself without sun protection. It’s a habit that your skin will thank you for as you get older. Many think that wearing a hat will provide adequate eye protection, but the powerful UV rays of the sun are more harmful to our eyes than some may think. Sunglasses are essential to shield your eyes from those intense sun rays that our bodies love so much. A good pair of sunglasses are a great gear investment. Oakley, Smith and other sport-focused sunglass ranges are available with replaceable lenses so that your initial investment can be long lasting if you happen to scratch a lens during your expeditions in the outdoors. It is easy to lose focus on maintaining your form, especially when training for a big event. When you are training for a competition or a big race, we tend to focus on finishing the 12-mile run that we set out to do and not focus on the details. Make sure you are engaging your core during fitness activities to avoid lower back strain when running. In addition to stretching, it is very important to protect your body against injury for long-term health.